"The additional perspective of a sculpture provides an artist with depth and detail you just won't find in a painted subject. They can be grand or introspective. The many materials that are available for sculpture also provide considerable range for interpretation. From one-of-a-kind to cast bronzes, look for exceptional form, appropriate condition and the detail you would expect from any given artist. If you do not find a sculpture you are looking for, please call or email, we may not have cataloged it yet." An excellent example of a well respected sculpture. 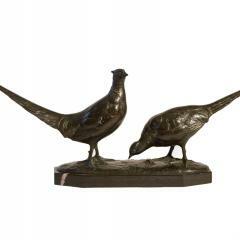 Two pheasants upon a marble pedestal.